Rotary Valves / Feeders are placed under the hoppers or bins to arrange for uniform feed of material to the conveying equipment. Basically it is a volumetric feeding device which helps in applications where the flow rate of the solids needs to be controlled. They can be designed to have approximately 85% volumetric efficiency. Rotary Valves have wide application in industry wherever dry free-flowing powders, granules, crystals, or pellets are used. It can be used to handle bulks even under high temperature. However it should not be used for hard and abrasive materials. Rotary Valve consists of star type rotor and casing. It is widely used for feeding material into pneumatic conveying line and periodical discharge of material from hopper. 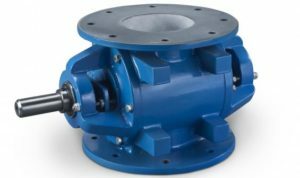 Rotary valves help in reducing hazards from explosive dust and volatile material due to air tight construction.